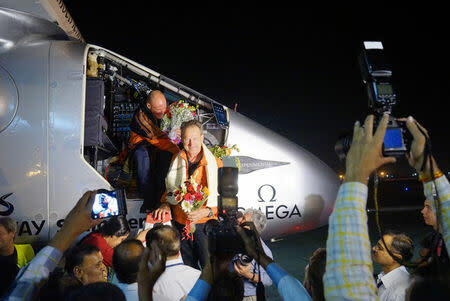 AHMEDABAD, India (Reuters) - The first round-the-world solar-powered flight landed in India on Wednesday, the second leg of a 35,000 km journey seeking to demonstrate that flying long distances fuelled by renewable energy is possible. 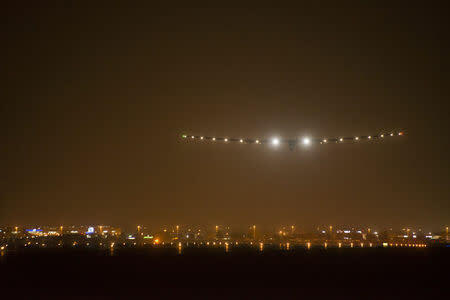 The Solar Impulse 2 arrived in Ahmedabad after a flight of about 15 hours over the Arabian Sea from Muscat in Oman. "It's a privilege to fly in an aeroplane like that," pilot Bertrand Piccard told reporters after landing. Piccard and fellow pilot Andre Borschberg will take turns at the controls of Solar Impulse 2, which began its journey in Abu Dhabi in the United Arab Emirates on Monday, as it makes its way around the globe in about 25 flight days at speeds of between 50 kph and 100 kph. The next stop is Varanasi, the constituency of Prime Minister Narendra Modi, who has made boosting clean energy a priority for his government. 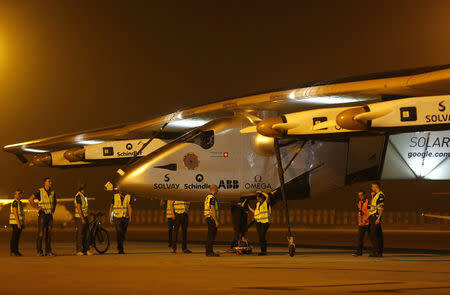 The aircraft is as heavy as a family car at 2,300 kg but has a wingspan as wide as the largest airliner.